Fourteen years after the last Jurassic Park film hit cinemas, the reptiles have been reanimated in a revamped take on the franchise. And this time, they're bigger and angrier. "I was 12 when Jurassic Park came out and it just blew me away," says Jurassic World actress Dallas Bryce Howard. "I remember watching it and thinking, 'I'm seeing real dinosaurs right now'. It felt so real." "I was 13 years old and I felt the same," her co-star Chris Pratt adds. "I had complete Jurassic-mania and saw it twice in one weekend." Steven Spielberg's Jurassic Park was a colossal blockbuster hit when it was released in 1993, taking more than $1bn (£646m) worldwide. Telling the story of philanthropist John Hammond's dream to create a theme park filled with real dinosaurs - which disastrously managed to escape - it captured a generation's imagination. Blending science with movie magic to create awe-inspiring creatures using cutting edge technology (for the time) it set a new standard for CGI, and became a touchstone of 1990s cinema. Fast forward 22 years and Jurassic World sees Hammond's dream become a reality. Still situated on Isla Nublar, it's now a fully functioning state-of-the-art theme park attracting some 20,000 visitors a day. A home to dinosaurs of every shape and size, it features a petting zoo where children can ride mini Triceratops, a SeaWorld-type aquatic arena which sees a massive Mosasaurus eat a great white shark as if it were small fry, while giant Apatosauruses graze in sweeping green fields. As visitor numbers start to decline, the park's scientists decide to create a new hybrid dinosaur to boost interest. But after the new dinosaurs escape - they always escape - park manager Claire (Howard) must enlist the help of animal behaviourist and ranger Owen (Pratt) to track down her missing nephews who are on a tour of the attraction. The last Jurassic Park film met with almost universally poor reviews and took significantly less at the box office than its predecessors. But producers say the 14-year wait between films only occurred because it has "taken this long for the right idea to materialise" to revitalise the franchise. Spielberg is still involved as an executive producer, and he handpicked Colin Trevorrow to sit in the director's chair - even though it would only be his second feature film after 2012 indie comedy Safety Not Guaranteed. Also involved in writing the screenplay, Trevorrow was faced with the challenge of matching the magic, thrills, horror and wonder of the original film, while making it fresh and relevant to a new generation. He was also keen to ensure there would be something for Jurassic Park fans, with several references to the first film peppering the story. "It was the mandate for me because I don't want to be seen as discarding those movies," he says. "It is definitely a sequel, but it was important I do it in a subtle way that is reserved and woven into the background enough so, for people who want it, it will be there for them - and for people who want to see something new, they'll be able to have that, too." With Jurassic Park famous for its advances in animatronics and CGI, the Jurassic World crew were aware they wouldn't be able to take as big a technological leap with this film. They instead focussed on trying to make the dinosaurs look as real as possible by building full-scale animatronic puppets and using motion capture. That, coupled with a release in both 3D and Imax, means Trevorrow expects the film to leave audiences in wide-eyed wonder. "I wanted it to reach a point where you sit back and that part of your brain that's constantly breaking things down and says 'I know how they did that magic trick' - goes away," he says. "I don't want to meet the kid that goes to a magic show and is constantly trying to figure out how they do the trick - I want the kid who is amazed. I think we can all become that kid if something is presented to us in a way that makes us not want to know how its done, and just want to be entertained." The director's aim was also to prompt nostalgia for the original Jurassic Park. "We have a moment where our two young characters get to go back to a place that existed before [the current theme park], but was old and overgrown and forgotten," Trevorrow says. "There's something about going back to places that is very sentimental and warm. It does something different than when you see people you used to know, and I wanted the emotion attached to going to the places that you used to exist in." Howard says the film gave her childhood flashbacks the first time she saw it. "It's hilarious because I was on set every day and I knew what was happening, yet when I saw the movie for the first time I consistently screamed from minute 15 until the two-hour mark," she says. "It's absolutely so terrifying and gripping, and filled with so much adventure - I felt totally like a kid when I watched it." But Pratt says his close involvement with the film has made him unable to recapture his early Jurassic-mania, much to his disappointment. "I'm so connected to it I don't get that objectivity," he says. "I'm never going to be able to just sit down and watch Jurassic World for the first time the way you do. I got swept up in the story a little bit when I first saw it, but I'm mostly picking things apart." But he takes heart from words of advice Spielberg gave him: "He said to me: 'This is a gift - a movie like this is something you work very hard to give to people. You're not going to be surprised when that gift gets opened because you wrapped it'." Although Spielberg was closely involved in the creation of the story, he was not on set during filming. "He stepped back and trusted me to make the film I wanted to make," Trevorrow says. "It was important to him I do something I could feel was my own because he knew I was going to be respectful of Jurassic Park. "Seeing him get sucked into it [in post production] and forget he's watching a movie is the best compliment I could ever get." 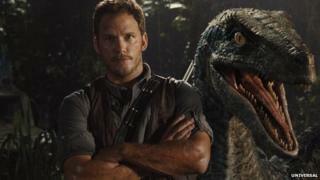 So is a second Jurassic World film on the horizon if this turns out to be a success? And will Trevorrow be part of it? "I don't know if I'll be involved or not," he says. "I definitely want to make sure it's carried on to the right place so I'm sure I'll have some level of involvement, but there are ideas that are very subtly buried into [this film] that suggest we could go some place beyond where we are. "One of them is that this little group of scientists won't always be the only people who can make a dinosaur. So what if that technology was to go open source and everybody could do it - what kind of world would that be?" Jurassic World is on general release from 11 June.